Can opposites really attract? Can a serious rooster find lasting love with a fun-loving free spirited horse? Can either one adapt and adjust to a partner so very different from themselves? 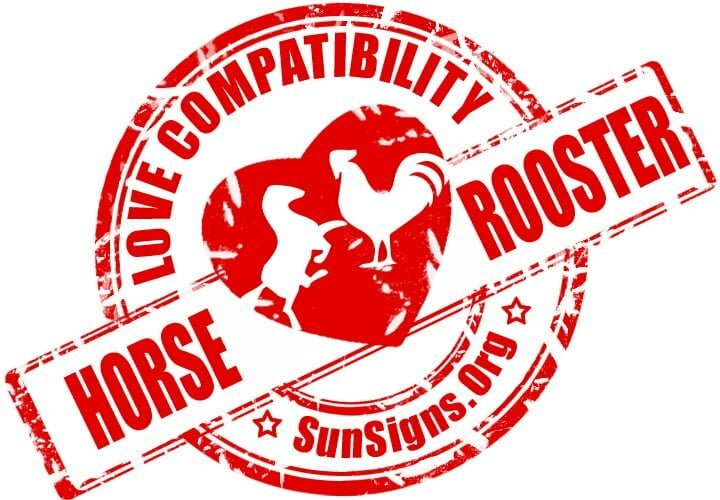 Just how compatible are the horse and rooster in love? How much work is in store for a couple born under these Chinese astrology signs? The horse and rooster soulmates will inevitably have a real intelligent connection and can keep each other intellectually coming back for more. The horse and rooster relationship has a good chance of being successful. They have some traits that would seem to contradict each other, but as it turns out work very well together. The erratic tendencies of a horse seem in direct contrast with the rooster’s demanding perfectionism. Yet the one’s adaptability and the other’s talent for stifling their nagging urge makes these two work quite well. The rooster is a very bright individual, with a sharp eye that endlessly picks up certain nuances of detail. This is why they are such perfectionists and will demand it whenever they can. They tend to have precise intelligence which seems to attract their partner. Oddly enough, when the horse is dating the rooster, they find this very appealing. They make clever, stimulating mates due to their broad intelligence in a variety of subjects. Sexually, the horse and rooster in bed make excellent partners. Problems in the horse and rooster friendship are more likely to arise when they live together. Roosters are devoted and trustful by nature. They can be highly irritating to their roommates if they neglect to stifle the urge to criticize those they live with. They prefer a house that is flawlessly clean and everything in its place. Horses can’t abide by these preferences very well, as they have a frequent tendency to begin a project and then discard it part way through. This will be highly unacceptable to their partner. This is typically because they find something they would prefer to do instead and it interests them more than whatever they were working on before. They will also find it difficult to make relationships last. The Chinese zodiac male or female horse is very often charming and talented. They can very often suddenly disappear if they find themselves suffering from tedium. They have a breezy attitude that can’t be bothered by their partner’s blunt and critical attitude. They will prefer the path be more daring and mercurial and has no plans set in stone. The male or female rooster is somber and envious. They will find at times that they are left to handle any chaos left behind. They will find this behavior utterly unacceptable. Their careful planning means they have a path they want to follow, direct and to the point. In Chinese horoscope, the horse man and rooster woman can be seen forming what some would call an irrational but working union. The extravagant horse woman might find the prospect of being linked to a straight-laced rooster man with plans for a quiet life an impossibility to accept. When it comes to marriage between horses and roosters they will have difficulty understanding each other. Outsiders listening in will realize quickly that the horse and rooster breakup might be on the cards. They will frequently have issues staying on the same viewpoints or even looking in the same direction. What is necessary for the horse rooster love compatibility to be successful is to desire a personality that is a contrast to their own. They also must find common ground and have an interest that will keep both of them invested for the long haul, together. Horse & Rooster Chinese Horoscope Compatibility Rated 4 Hearts!